Taking my monthly browse of the Journal of Strength and Conditioning Research, I found a study that peaked my interest entitled – Using the load-velocity relationship for 1RM prediction. One of the main reasons it peaked my interest was due to it’s use of an experimental approach to try and derive a predictive equation with some real world application. These types of studies are few and far between but highly influential when they have any form of validity (RM % studies as a direct example). 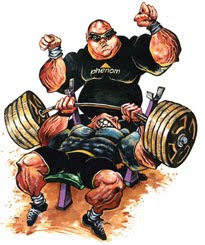 Using 112 subjects for a collaboration of 3 previous studies the authors used a linear transducer to determine the velocity of a concentric only bench press performed using a smith machine 3 cm from the chest. Using 3 or 4 increasing loads they plotted the velocity of the bar and used the drop off in speed with relation to the increase in load to try and predict 1 RM. They found very strong co-relations in all three studies as shown in the above figure, this strong a relationship are few and far between and lends a lot of validity to this measurement. If a quick and easy protocol could be derived from this study that had a high percentage of accuracy it could greatly improve the ease of 1RM testing. In this study the authors offer an accuracy with a 7% deviation, although not perfect does give a reasonable prediction of an athlete’s force capabilities and certainly one in line with rep to failure testing. they report a bench press 1 RM of 60kg +/- 17 kg for the group placing the heaviest bench at 77 kg and lightest at 43 lg which by any means would represent a novice population. Using a concentric smith machine bench press negates eccentric/concentric action and linear deviation which would be experienced in a bench press. A uniform bar path and concentric only motion produces a “goldilocks” world of bench press where all reps move in a fixed path one way, which almost instantly sets up an environment for a very convincing force/velocity relationship. Their recommended protocol calls for 3-4 loads, with 3-5 trials at each load with enough rest between trials to facilitate full recovery. At 90 seconds a trial (which would not allow for full recovery) you are looking at a 13.5 minute investment with a lot of arsing around with computers and traducers making this protocol almost more time consuming and less accurate then a 1 RM test. These concerns aside this is a reasonably encouraging study that with a more efficient protocol could be used to quickly measure an athlete’s 1RM also the authors point out this protocol’s applicability to populations such as the elderly or children.